The gift that gives back! PageHabit offers a monthly book subscription service that connects readers to authors. Each box comes with a brand new release, peppered with exclusive author annotations, delightful bookish goods and a curated short story. For each box purchased, PageHabit makes a donation to support children’s literacy around the world. PageHabit is available in 8 genres including Mystery, Fantasy, Historical Fiction, Young Adult, and more! It’s the perfect gift for any reader in your life. Bundles are available for 3 months, 6 months, and 1 year! It is one of my favorite times of the year: gift shopping season! I take great pleasure in picking out the perfect gift for the important people in my life, and I love it even more if they’re bookish. Check out my ten gift suggestions for the reader in your life. And if you (like me) pick up one or two for yourself along the way, I won’t tell. Conventional wisdom says books and fire don’t mix, but bookish candles are the exception. You can get candles that smell like old books (hey, who among us hasn’t done some book sniffing every now and then?) or with scents inspired by your loved one’s favorite books, including Harry Potter, Edgar Allen Poe, Pride and Prejudice, Game of Thrones, and more. “Do I dare disturb the universe?” – T. S. Eliot. || How do you take your afternoon tea? Status quo or "stir things up?" Print from our Bibliophilia collection. Elegant language deserves a stylish upgrade. There’s something about a colorful painting atop an old black-and-white book page that makes my heart happy. I’ve also long been a fan of ObviousState’s illustrated quote prints. And if you can’t choose one, get the calendar for a new print every month! Book nerds usually don’t mind sharing our books, but we’d like to get them back eventually. A personalized library stamp is a great (and super cute) way to ensure book borrowers won’t forget where to return the book when they finish reading. 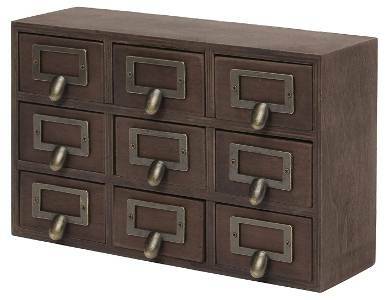 Original card catalogs are the dream, but they’re expensive, hard-to-find, and take up a lot of space. Get this mini version for the reader who wants to store their office supplies or jewelry in bookish style. Two blocks from Grand Central Station and one block from the iconic New York Public Library, the Library Hotel is the perfect home-base for an adventure in America’s literary capital. Bonus: their reading room is available 24 hours a day and features hundreds of books—and complimentary snacks! No lie, I have posted this lamp that looks like an open book to my Facebook three times trying to get someone to buy it for me and am not above posting it a fourth time. It’s simple and beautiful and makes any room feel slightly magical. If your favorite ebook reader also enjoys the outdoors (even if their definition of “outdoors” is the back porch), they will be thankful for this solar power bank. Whether they’re relaxing in a window bench or camping in the wilderness, they won’t have to worry about their Kindle running out of juice! Etsy is rich with hand-crafted book-themed jewelry that I can spend all day browsing. From more general book stack earrings to bracelets stamped with Pride and Prejudice quotes, there is a jewelry piece perfect for almost any reader. Maybe it’s all the cozy mysteries I read as a kid, or the spy movies I devoured, but there is something so gratifying about hiding stuff in plain sight. Since your reader probably has a couple (hundred) books, a book safe or box will blend right in. Get a locking book for the person who has valuables to conceal or an unsecured book box for someone who simply needs somewhere to stash their clutter. As someone who works in a library, I can vouch for how excited book-lovers get when they see one of these beauties. Most of ours are metal, but people go gaga over the remaining wooden ones. If you can’t find an old one, they’re still making brand new wooden carts you can buy.